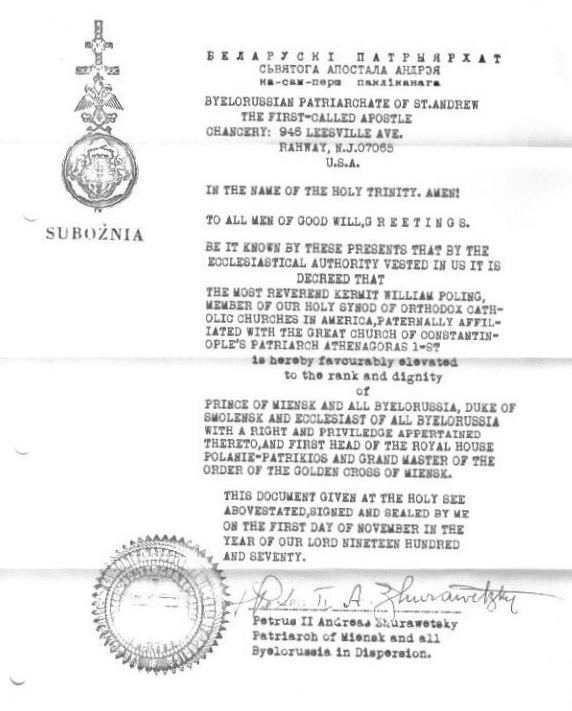 The Royal House Polanie-Patrikios was formally established on 1 November 1970 by the Patriarch of Miensk and All Byelorussia in Dispersion and President of the Holy Synod of the Orthodox Catholic Churches in America, His Beatitude Peter II Zhurawetsky (1901-94) with His Serene Highness the Most Reverend Kermit William Poling (1941-2015) being crowned in exile as the first Prince of Miensk and All Byelorussia, Duke of Smolensk, and Ecclesiast of All Byelorussia of the Byelorussian Patriarchate of St Andrew the First-Called Apostle, and elevated to the position of Head of the Royal House Polanie-Patrikios. The Kievan Rus were first reported to have been converted to Christianity under the Ecumenical Patriarch Photius I around 867A.D. Their first bishop was provided by Constantinople. A century later, the Baptism of Kiev firmly allied the Rus with the Byzantine Empire. According to the Primary Chronicle, at Constantinople, the advisors of Prince Vladimir the Great of Kiev were so astounded by the beauty of the cathedral of Hagia Sophia (Church of the Holy Wisdom) and the liturgical service held there that they made up their minds there and then about the faith they would like to follow. Accordingly, Prince Vladimir travelled to Constantinople where he was received into the Orthodox Church by baptism and married the sister of the Byzantine Emperor. It was to these twin roots in the Ecumenical Patriarchate and the Byzantine Empire that Belarusian monarchists and advocates for a national Orthodox church would turn during the events of 1970. Patriarch Peter II Zhurawetsky was recognized by the Ecumenical Patriarch (who had on 20 March 1932 ordained him priest), while Prince Kermit William could trace his ancestry to Rurik and the first Belarusian rulers as well as several of the Byzantine emperors, making him a Hereditary Patrician of the Eastern Roman Empire. He was also a direct descendant of the earliest Polish rulers, the Dukes of the Polans and Princes of Gniezno. In a direct reflection of the birth of Christianity in the Kievan Rus, a Ceremony of Affirmation of the Royal House Polanie-Patrikios took place in the Hagia Sophia, Constantinople, on 16 November 1995, led by Prince Kermit William together with international guests. This ceremony was of considerable symbolic importance because of the loss of the Hagia Sophia to Christendom since the fall of Byzantium in 1453. In the Imperial Church of the Eastern Roman Empire, The Hagia Sophia (Holy Wisdom), on November 16th, His Serene Highness Prince Kermit William (Poling) Polanie-Patrikios de Gniezno, affirmed his blood right of descent and his chiefship of the House and Arms of the Imperial line of the Emperor Leo V (Patrikios) the Armenian. His direct ancestral lines to the Imperial Houses of the Amorians, Macedonians, Lecapenus, Monomachos, Comnenos and Angelos was confirmed also in the holy place where most had been crowned rulers of the Roman Empire in the East (later called The Byzantine Empire)…In a quiet and solemn moment inside the historic cathedral H.S.H. with the Gospels in hand, affirmed by Almighty God and upon the Gospels, the undisputed blood right and unbroken ancestral lineage from Emperor Leo V, and claimed the privilege and responsibility as Chief of the Dynastic House Patrikios. He also confirmed dynastic rights to his heirs for all generations to come, and confirmed all titles and honors conferred by the House in the past and in the future. Our Dynastic Head then laid insignia of the Byzantine Order of Leo V the Armenian on one of the great pillars of the church and dedicated the knights, dames and objectives of the Order to the Glory of God and to the memory and honor of the Emperor Leo V.
The last indigenous monarchy in Belarus was the Duchy of Polotsk, founded by the first Prince, Rogvolod (who may have been Norwegian), in 845AD. The Duchy was conquered by Prince Vladimir the Great of Kiev in 978 and thereafter was ruled by the Rurikid dynasty until annexation by the Grand Duchy of Lithuania in 1242. The Principality of Miensk was originally an appanage principality of the Duchy of Polotsk, founded in 1101 and continuing to be a nominal fief until 1326. The line of the Belarusian Royal House left no immediate heirs and only collateral descendants, among whom was included Prince Kermit William of Miensk. The authorities in Belarus have for many years sought to suppress the national church and to replace it with the Russian Orthodox Church. In 1922, the Byelorussian Autocephalous Metropolia was founded at a Sobor in Minsk by former members of the Polish Orthodox Church, which would be granted autocephaly by the Ecumenical Patriarch in 1924, but this church had effectively been suppressed in Stalin’s “Great Purge” by 1938. During Nazi occupation, a new Sobor in Minsk in 1942, formed by clergy willing to collaborate with the Nazi regime, declared an autonomous Byelorussian Autocephalous Orthodox Church. The defeat of Nazism meant that this church was absorbed into the Russian Orthodox Church outside Russia in 1946. Attempts to revive Belarusian Orthodoxy in the following years were restricted to the diaspora. Patriarch Peter II Zhurawetsky occupied an unique position within Belarusian affairs. 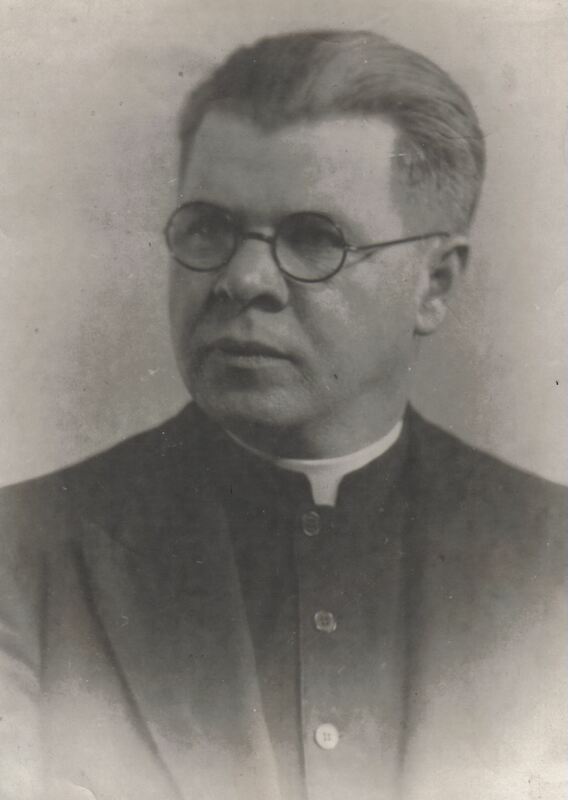 Born in Galicia, in what was then Austria but is now Ukraine, on 7 December 1901, he trained at the Theological Seminary in Vienna and went in 1925 to the United States of America. There he spent his life in exile working principally with immigrant Lithuanian, Ukrainian, Polish and Belarusian communities and in establishing an autocephalous American Orthodox Patriarchate. His church became during those years a focal point for Belarusians and others who were seeking their national traditions. During the Soviet years, Belarusian nationalism centred upon the only remaining traditional indigenous authority – the Church – which embodied all that survived of the Belarusian State amid the oppression first of Lithuania, then of Poland, the Russian Empire and finally the Communists of the Soviet Union. Even when independence would finally be achieved in 1991, there was no place for monarchism in the new republican regime. With no surviving Royal House of their own, Belarusian monarchists in exile sought to remedy this situation and create a rallying-point for their cause. Within Eastern Orthodoxy, the Church does not merely possess sacred authority, it also bestows authority on the secular ruler. Thus the sovereignty of the Czar comes from his anointing by the Church at his coronation, not simply from a dynastic succession or territorial rule. 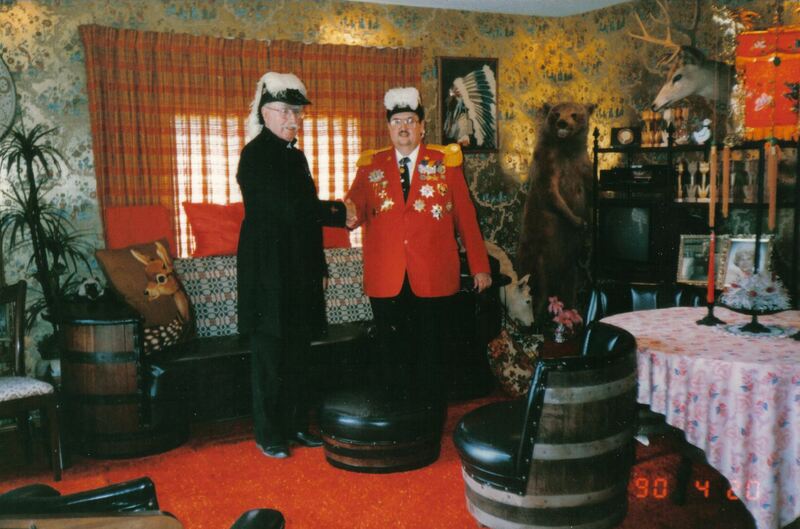 The Prince of Miensk is also Ecclesiast of All Byelorussia and thus the chief hierarch of the Belarusian Patriarchate next to the Patriarch; he is therefore both a secular and a religious figure and an embodiment of the tradition of sacred royalty. The approach of Eastern Orthodoxy towards chivalric and nobiliary matters, in which the sacred and secular are often extremely closely related, should not be confused with the more clearly differentiated view prevalent today in Europe and the West. 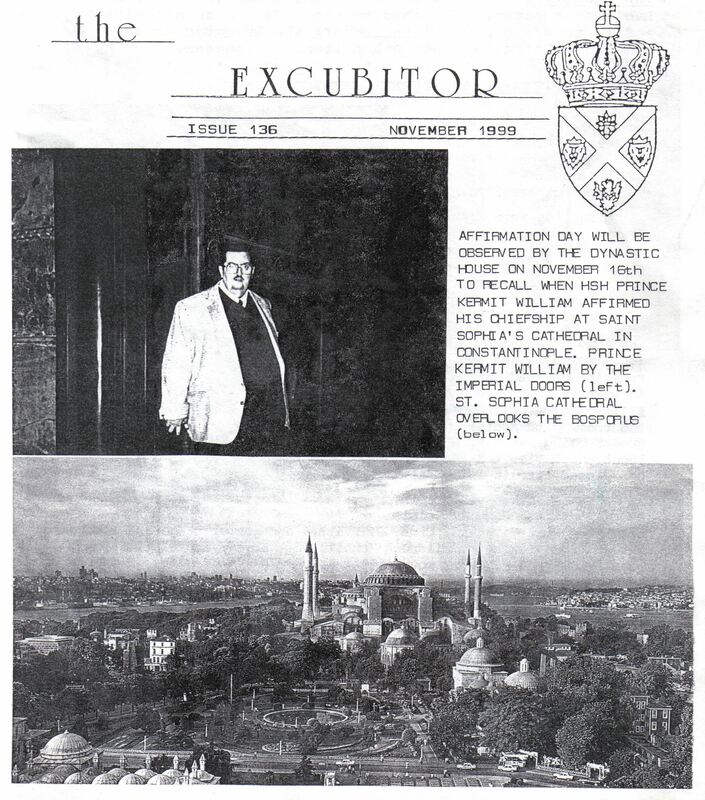 Prince Kermit William also enjoyed friendly relations with the Ecumenical Patriarch; a letter from the Ecumenical Patriarch of 27 July 1970 describes him as “a precious and beloved collaborator into the expansion of this common faith [of Christ]” and invokes upon him “every celestial gift”. The Ecumenical Patriarch also accepted membership of one of the Dynastic Orders of the Royal House Polanie-Patrikios, the Order of the Sacred Cup. The Principality of Miensk and the Royal House Polanie-Patrikios remain today as symbols of Belarus’s monarchical heritage, and the Belarus Monarchist Association continues to advocate that Belarus should once again embrace the sacred traditions of monarchy. Support for the cause of monarchical restoration in Belarus remains confined to a select group, but it continues to attract interest from around the world and the Association remains committed to providing a beacon of light during what is, for the Royal House, still a period of exile. Today, the Prince of Miensk continues to lead the Byelorussian Patriarchate of St Andrew the First-Called Apostle, whose office of Patriarch has been vacant since the death of Peter II in 1994, and was in a supportive relationship of intercommunion with the Belarus Autocephalous Orthodox National Church, which at one point had a substantial following in Belarus in recent decades despite continuing official persecution, but effectively ceased activity on the death of Patriarch Yuri I in 2016. Although it might at first sight seem unusual that both Princes of Miensk to date have not been Belarusian by recent ancestry or citizenship, this is certainly not without ample precedent. The Royal Family of Belgium is neither French nor Flemish, but German; that of Greece is Danish. Albania was ruled by another German, Prince William of Wied, who was preferred over the indigenous candidates, and Britain was ruled by German princes from 1714 onwards. Such a Royal House has the cardinal advantage of independence from the immediate past of Belarus. Prince Kermit William’s tireless work was rewarded by Royal Houses, churches and organizations all over the world. Under Prince Kermit William, the Statutes of the House were drawn up, the Dynastic Orders constituted, and relationships of recognition and co-operation established with friends and allies. The home of Prince Kermit William and his wife Princess Patricia in West Virginia, USA, became a centre not only for monarchist activities but for a celebration of American history and heritage. For Prince Kermit William there was no contradiction between commemorating and honouring one’s royal ancestry and rank while at the same time embracing fully the culture and values of the United States. 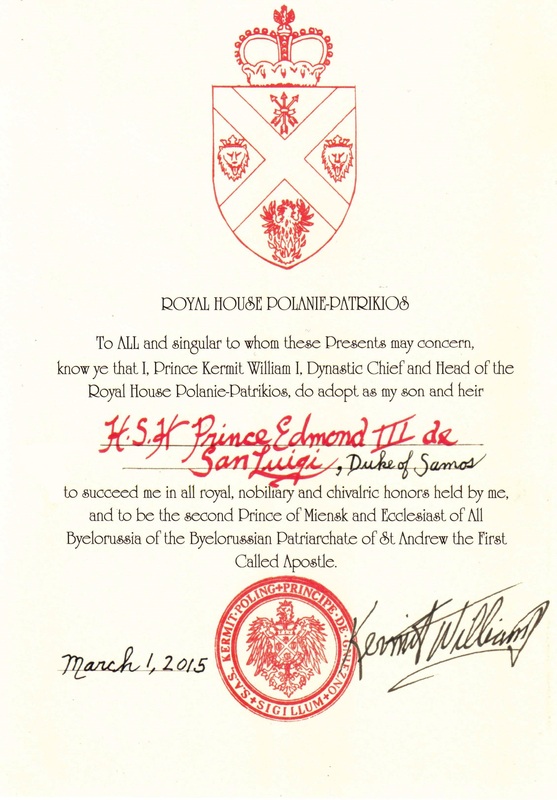 In 2015, His Serene Highness Prince Edmond III de San Luigi (The Most Reverend Edmond John Kersey), a close associate of Prince Kermit William in his last years and Duke of Samos in the Royal House Polanie-Patrikios, was adopted as heir to the Principality of Miensk and the headship of the Royal House, succeeding to these honours on the death of Prince Kermit William on 31 March 2015. Prince Edmond had previously succeeded to the title of Prince of Vilna and All Byelorussia, which was created by Patriarch Peter Zhurawetsky (with the support of Prince Kermit William) on 11 February 1971 in favour of the late Archbishop Frederick Charles King (1917-85), and was also Grand Master of the Royal Order of the Imperial Crown of Byelorussia in succession to Prince Frederick of Vilna. Prince Edmond of Miensk, who lives in the United Kingdom, has established the Belarus Monarchist Association for supporters of the cause of Belarusian monarchical restoration, and set in place several other initiatives to raise the profile of his cause in diaspora.